Congratulatory messages have been coming from all over the world after Iraq’s Prime Minister Haider al-Abadi announced the army’s victory over the Islamic State group (IS) in Mosul; the last bastion of the group. 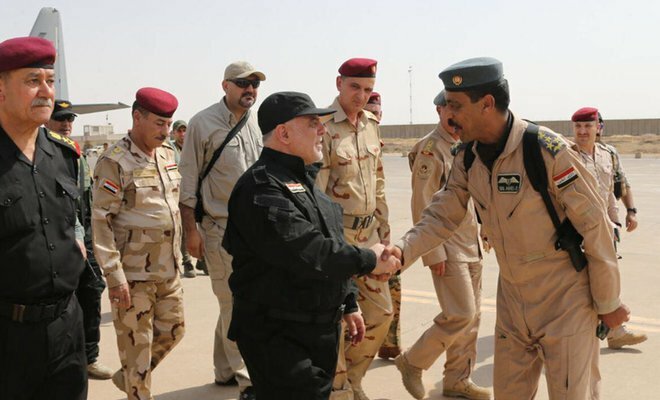 Prime Minister Abadi congratulated the army in Mosul after arriving in the city to celebrate “heroic soldiers” and the Iraqi people for the win over the terror group. The army was able to take over the hard-line Sunni terrorist group after nine months of urban fighting. Mosul is Iraq’s second largest city and is the largest IS-occupied city to fall under government forces’ control. As the victory over the terror group has been officially declared, France and UK, both members of the US-led coalition providing air support, have praised the takeover of the city by Iraqi forces. “Mosul liberated from ISIS: France pays homage to all those, who alongside our troops, contributed to this victory,” French President Emmanuel Macron tweeted. London through its Defense Secretary also showered the Iraqi official and army with acclaims. “I congratulate Prime Minister Abadi, and the Iraqi forces who have been fighting on the ground with great bravery and care against a brutal opponent,” said Michael Fallon in a statement. “This barbaric group remains dug in west of the Euphrates and clearing operations in and around Mosul will be needed because of the threat from improvised explosive devices,” he cautioned. An unknown group of militants sprung to global celebrity status under the sobriquet Islamic State in Syria and Levant (ISIL) in June 2014 when Abu Bakr al-Baghdadi announced the establishment of an Islamic State in Mosul’s iconic leaning minaret mosque before waging an offensive attack to control almost more than half of the country. The extremist group is now cornered in a small territory in what used to be its de-facto capital but still controls towns at the southern and western part of it. There have been celebrations in some parts of the city but fighting is still ongoing as warplanes bombed ISIS positions. Military officials are aware that ending the extremist group’s control of the city would not end the threats because the militants are expected to undertake insurgency operations. Written by: Peter Mulvany on July 10, 2017. Posted by Peter Mulvany on Jul 10 2017. Filed under Headlines, World News. You can follow any responses to this entry through the RSS 2.0. Both comments and pings are currently closed.